Can you ride on a sidewalk in Baton Rouge? And should you? Louisiana state law does not prohibit riding a bicycle on a sidewalk. City ordinance, however, restricts riding on sidewalks in 'business districts', which are defined by Louisiana state law as "... territory contiguous to and including a highway when within any six hundred feet along such highway there are buildings in use for business or industrial purposes, including but not limited to hotels, banks, or office buildings, railroad stations and public buildings which occupy at least three hundred feet frontage on one side or three hundred feet collectively on both sides of the highway." We read it a handful of times and managed to condense it down into something a little more manageable. A sidewalk counts as being in a business district when there are a total of 300 feet or more of public or business buildings on either side of the road within a 600 foot length of that road. If you don't have a tape measure with you while riding, then as a rule of thumb, if 25% or more of the roadway is lined with public or business buildings, you're probably in a 'business district'. Here are a few examples from around Baton Rouge for what these kinds of areas look like. If you ARE going to ride on the sidewalk, then there are a couple of other things to consider. The main one is driveways. Drivers who are pulling out of driveways that cross sidewalks expect to encounter pedestrians, who are likely travelling at no more than three miles per hour. If you're pedaling along at ten miles per hour, or more, then you're outside of the area that a driver may look - and could end up being hit as the driver pulls out. You're even more likely to be hit if you're riding on the sidewalk against traffic (on the 'left' side of the road), as drivers will be looking towards traffic to their left as you're approaching from their right. Take note, also, of the sidewalk condition - which often may be bumpy, cracked, or otherwise hazardous. If you're riding on the sidewalk use caution at all driveways, and assume that drivers will NOT see you - particularly if you're riding against traffic. When do I have to ride on the sidewalk? Never! If a sidewalk exists outside of a business district, then if you choose to ride on it, by all means have at it! But you're just as welcome to ride on the road. Louisiana law does not make use of sidewalks, bike lanes, shoulders, or separated bike paths mandatory at any time, but Baton Rouge city ordinance states that 'Whenever a usable path for bicycles has been provided adjacent to a roadway, bicycle riders shall use such path and shall not use the roadway'. Note the inclusion of the word 'usable'. If the path is blocked, in a state of disrepair, in any way substandard to the roadway, or otherwise 'unusable' - then you may ride in the roadway if you so choose. We would argue that given a) the state of sidewalks in Baton Rouge, b) the connectivity of sidewalks in Baton Rouge, and c) the inherent danger of riding on sidewalks as described above, that all sidewalks in Baton Rouge could be argued to be 'unusable' in this context. As always, if you're having trouble getting around by bike safely and easily - check out our bike map for the best routes in Baton Rouge! NOTE : We're not lawyers. We're not legal experts. Sometimes we don't wear pants while we're writing this stuff. Don't take our word (or anyone else's word) for anything. Read the law yourself so that you can be well informed! 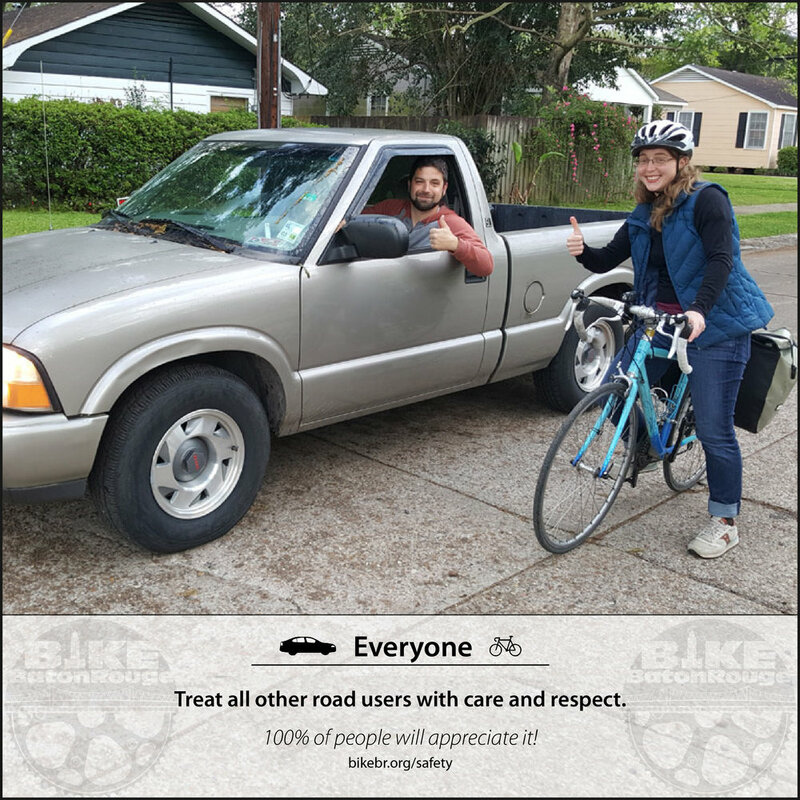 Bike Baton Rouge, a local non-profit bicycle advocacy organization, today released a short list of bike safety tips which they hope will result in increased safety amongst bicyclists and motorists sharing the road. Spring sees greatly increased bicycling as the warmer weather and extended evening daylight hours allow for more people to bicycle after work or school. The last two weeks have seen several bicyclists and pedestrians involved in motor vehicle crashes in Baton Rouge, particularly along Florida Boulevard - a road, that Bike Baton Rouge notes, has no bicycle or pedestrian facilities on a near eleven mile stretch between North 19th Street and the East Baton Rouge Parish border at the Amite river. Louisiana ranks third in the nation for adult bicycling deaths after Delaware (second) and Florida (first) according to a 2015 study by the Center for Disease Control, but Torkkola says that Louisiana rankings will improve as both bicyclists and motorists become more accustomed to the increased numbers of people riding bicycles in the state. 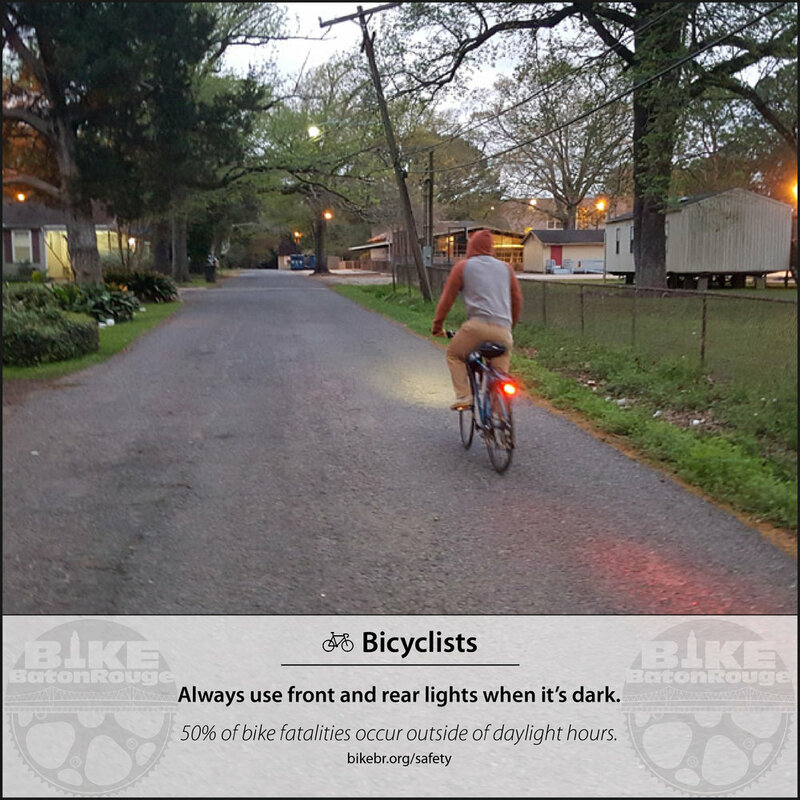 The complete set of Spring Safety Tip graphics are available at bikebr.org/safety, and include tips for both bicyclists and motorists, complete with statistics that show the resulting safety increases associated with correctly following each tip. Each safety tip is based on Louisiana road law. Bike Baton Rouge was deeply saddened to learn of the death of a bicyclist following a collision with an 18-wheeler on Plank Road in North Baton Rouge. Bike Baton Rouge would like to extend our condolences to the friends and family of the victim. Per police reports, the as yet unnamed bicyclists was riding northbound in the southbound traffic lane when he was struck by a turning 18-wheeler at the intersection of Byron Avenue. 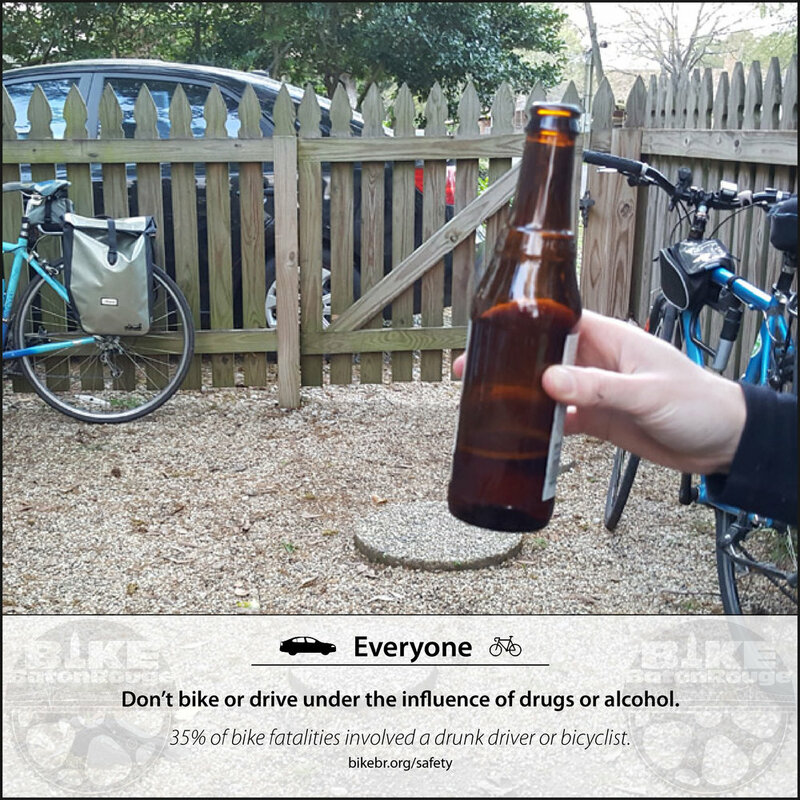 Unfortunately, collisions involving bicycles travelling against traffic occur with alarming frequency, and Bike Baton Rouge would like to remind all bicyclists that riding against traffic is both an illegal and highly dangerous activity. Bike Baton Rouge notes that there are very few bike lanes in Baton Rouge, and fewer still in the Northern parts of the city, where many residents use bicycles as their primary means of transportation.